Today an important piece of science news has been buried amongst the shocking revelations of chemical weapons used in Syria and the more trivial but captivating stories of human brain tissue grown in a test tube. A paper in the journal Nature by Yu Kosaka and Shang-Ping Xie from Scripps Institution of Oceanography has assembled and tested evidence explaining the seemingly erratic nature of global temperature changes in the past half century. It’s a quiet evening here in Western Scotland; the sea is placid and there is an eerie calm before a predicted gale tomorrow morning. I rowed out to my 77 year-old ketch Ettrick swaying gently on her mooring. It is a good place to work, my laptop glowing white in the dim light of the navigation table. No distractions apart from the occasional whir of the bilge pump reminding me that the pitch pine planks have still not completely ‘taken up’, swollen enough to plug all the little leaks (this usually happens just before I take her out of the water again). Global temperature anomalies during the lifetime of Ettick (based on data from CRU) and a speculative indication of what might happen in the next decades. For the entire life of Ettrick, and even before, the world’s climate has been changing and temperature has been on the rise, mostly due to human activities that release greenhouse gases. The global average rise hasn’t been constant, however, and there have been two clear flat periods where the process seems to have stalled: the period from about 1943 to 1972 and the current period, starting just before the beginning of the Millennium. The latest of these two periods has been the lynchpin in the argument of climate change sceptics (and deniers). They argue that if there is no temperature change, there is no global warming. Frankly, many scientists were also in denial but pointed out that temperature is still well above the long term average; if there was no global warming, they should have gone down again. But the fact remained that it was difficult to explain where the increasing amounts of heat is going, especially as the rise in greenhouse gases, particularly carbon dioxide, is inexorable. A little discussed fact is that the heat storage capacity of seawater is hugely greater than the atmosphere. Indeed, the entire heat storage of the atmosphere is equivalent to that of some 2.5 metres of the sea below it – and the average depth of the ocean is 4km! So the Earth’s atmospheric temperature field is incredibly sensitive to the way heat is stored and transported in the oceans. We have known for over a century that the tropical Pacific exhibits major climatic shifts related to an occasional switch in the east-west atmospheric pressure gradient. Most spectacularly, this can result in a surge of warm surface water near the coasts of Ecuador, Peru and Chile that suppresses the upwelling of cold sub-surface nutrient rich water that normally makes the sea particularly fertile in those places and ultimately leads to the richest fishery in the world. This phenomenon, commonly known as El Niño, has devastating economic consequences and leads to climatic anomalies in distant places on land. The reverse phenomenon, popularly named La Niña, also occurs from time to time, leading to a warm pool of water in the Western Pacific and intensified upwelling in the East. Again, there are associated climatic perturbations across the whole tropical world. Scientists have been trying to predict these ENSO (El Niño – Southern Oscillation) events for decades, and many have lost their reputation in the process. As longer data series became available, it was evident that, on a longer timescale, there were periods where El Niño or La Niña events were particularly frequent or intense and that a longer term cycle was present. Although this affects about 8% of the ocean surface, Kosaka and Xie have demonstrated it to change heat transport sufficiently to affect global temperatures. The flat part of the global temperature signal reflects periods where heat is transported away from the atmosphere more effectively. However, the reverse then occurs and temperature change accelerates again. But this is not simply a story of how to win arguments with climate change sceptics. After all, we should thank them for challenging scientific hubris. The stepwise change to our climate is even more worrying than a linear prediction of change. For a start, we don’t know when the new phase of accelerated temperature change will begin. And some communities of plants and animals may not be able to cope with the sudden rise. This happened around 1997 when exceptional temperatures triggered massive coral bleaching and death. How can we convince people that we are in the calm before the storm of renewed global warming? There are so many problems affecting our planet that it would be easy to put what appears to be a ‘non-problem’ aside, or even worse to happily exploit new reserves of fossil fuel because this is ‘good for the economy’. As scientists, we should look at the evidence very carefully and then find ways to communicate it to a wider audience if we are convinced ourselves. The Kosaka and Xie paper is only one step in unveiling the full story of ocean heat transport and I suspect that there will be some further major revelations as more data is assimilated into improved models. The authors claim to be able to explain the entire anomaly but the origins of the cycles behind the ENSO events remain unclear. We still don’t understand why marine climatology can suddenly switch from one state to another (the so-called ‘regime shifts’). In my view (and of many colleagues), there is a danger in hanging the entire climate change debate around a single indicator: global mean temperature. This ignores very significant regional variations and the all-important fact that a proportion of the heat absorbed by the ocean is being used to melt Arctic sea ice with global consequences. 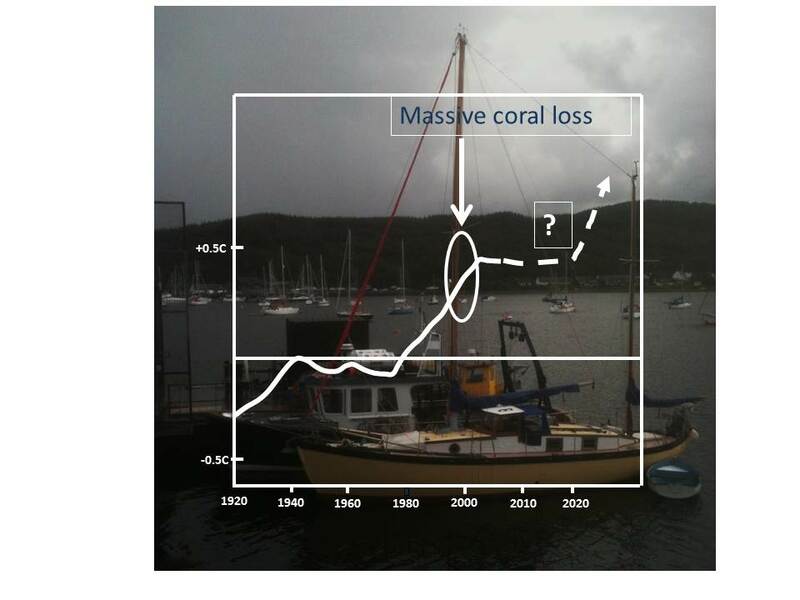 The biological effects of changes in the ocean are already being felt and have recently been clearly documented by my colleague Mike Burrows and others in a paper in Nature Climate Change. The ‘frontline’ of marine species distribution is moving towards the poles at an average of 72 km per decade, over ten times the speed of land species. And this is the long-term average, not taking into account the sudden spurts of temperature change that may well overtake the capacity of some natural systems to adapt. However, we have sufficient reasons to call for more precaution and to invest more in understanding the crucial role that the ocean plays in determining our future. No time for complacency.